This meal has been floating in my mind's eye for a while now. To see it finally come together, it was really a sense of accomplishment. This picture just does not do it justice. The colors were beautiful. 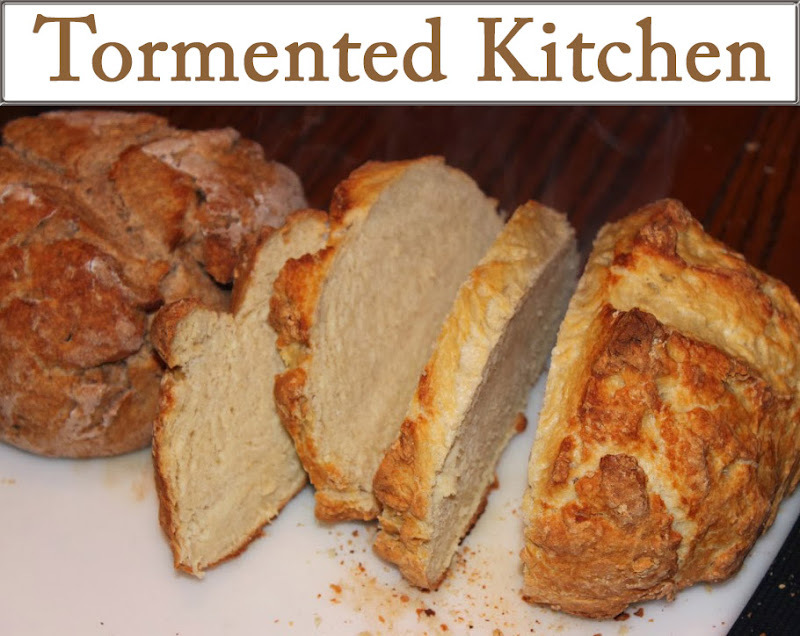 The flavors really complimented each other, some sweet, some tangy, some savory. Excellent combination! Back in the early summer, I was on a grilling kick. I think it's a seasonal thing for me. I wanted a grilled pork chop, but it's easy to go wrong on the grill. Sometimes it's hard to judge how hot to get the grill, how long to let the meat cook, and if you've hit it right or ruined it. The first time I made this, I tried two layers of bacon and basting the chops with apple juice. So it was OK. Just OK. As you know, for me just OK is never good enough. So back to the kitchen and lots of brainstorming and testing. I figured brining was the next logical step. I wanted a warm apple topping. Then, this came together. It was really good. I think I just had to wait for the right seasonal ingredients to make it really work. The meal itself consists of a bed of Barley Pilaf, then the grilled pork chop. 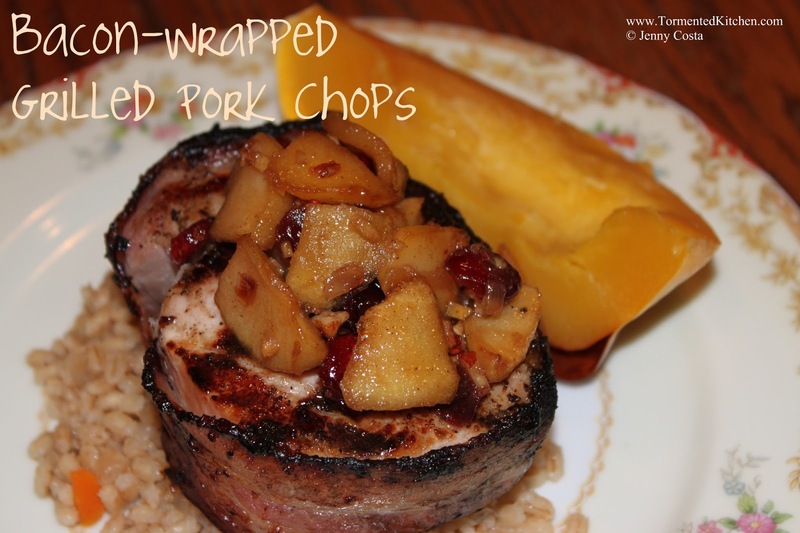 Top it with some warm Cranberry Apple Chutney, and a slice of Acorn Squash on the side. We also had French bread and butter because it's not really a good dinner unless there is bread. 1. 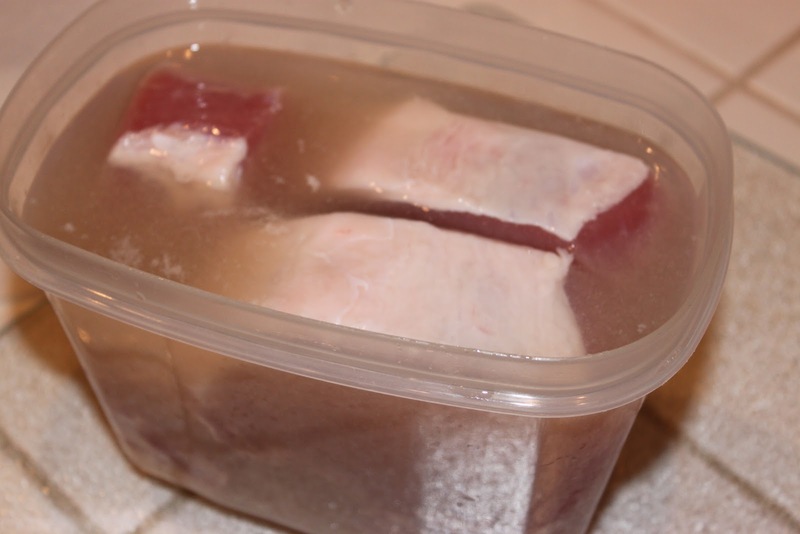 Combine the apple juice,water and salt in a plastic bag or food storage container big enough to hold the pork. Stir until the salt has dissolved. Add the pork. 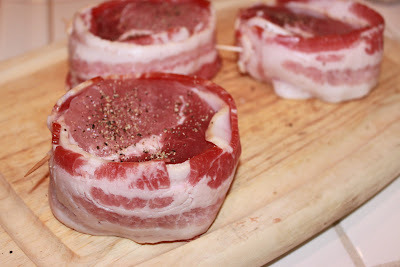 Make sure the chops are submerged in the brine. Refrigerate about 2-4 hours. Don't let this go too long or the pork will get way too salty. 2. Remove pork chops from brine. Rinse off with cool water and pat dry. 2. 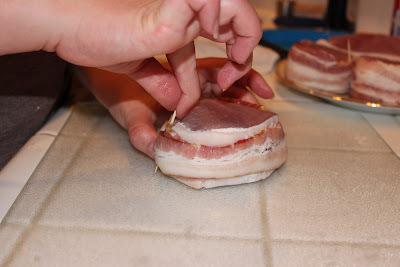 Wrap each chop with a slice of bacon, securing with a toothpick. 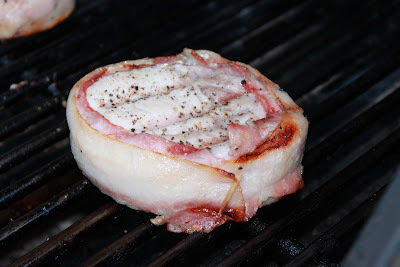 If your meat is a bit oblong, just smoosh it into a circle. The bacon will help it stay round. Season both sides with freshly ground black pepper. 3. Grill pork steaks over medium heat, turning every five minutes. 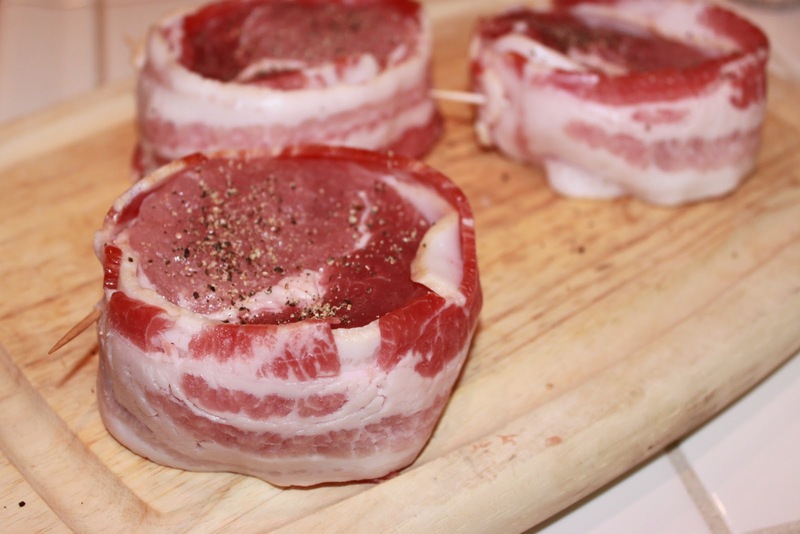 You will cook for a total of 20 minutes. 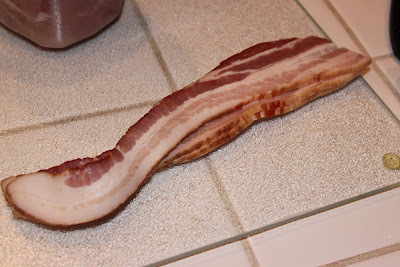 If you want your bacon a bit more crispy, use tongs to hold them on edge over the flame. 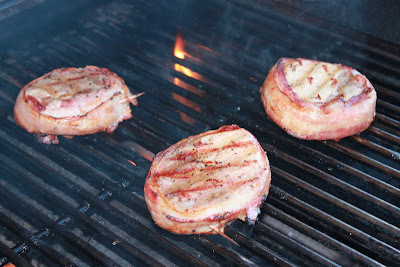 This also imparts smoky goodness to the flavor. 4. Carefully remove the toothpicks. You don't want the bacon to fall off. Serve with pilaf, squash, and chutney as described above. Yum!